“Austrian” economics owes its name to the historical fact that it was founded and first elaborated by three Austrians: Carl Menger (1840–1921), Friedrich von Wieser (1851–1926), and Eugen von Böhm-Bawerk (1851-1914). 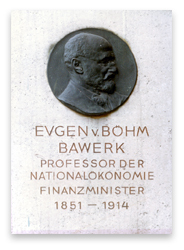 The latter two built on Menger, though Böhm-Bawerk, in particular, made important additional contributions. Read more via Understanding “Austrian” Economics – Henry Hazlitt – Mises Daily.